Lucky Jack is a Canadian-born curly horse. He is the author’s main mountain horse. Dr. Mitch Wilkinson, in the first of a three-part series, unravels the mysteries of the curly coats found on some horses. Wilkinson, a lifelong horse enthusiast with a post-doctoral master’s degree from Baylor University in biology, as well as dental and chemistry degrees, is chairman of the Curly Mustang Association and is vice-chairman of the Research Department of the International Curly Horse Organization (ICHO). The series is published courtesy of the ICHO Gazette. A great unsolved mystery in the equine world is the origin of curly haired horses in both the domestic and wild horse populations, not only in the Americas, but also parts of Asia. The present histories of curly horse introductions into North and South America are based on oral legends, dubious speculations, and suppositions based on incomplete information that have been repeatedly stated over several decades to become something that masquerades as truth, but in fact, has little factual basis. The legend of an Irish immigrant, horse breeder named Tom Dixon bringing curly horses to Northern Nevada via India in the late nineteenth century has documented evidence in the Nevada State Archives, but the actual evidence is based on a second-hand testimonial that was preserved in the 1950s. 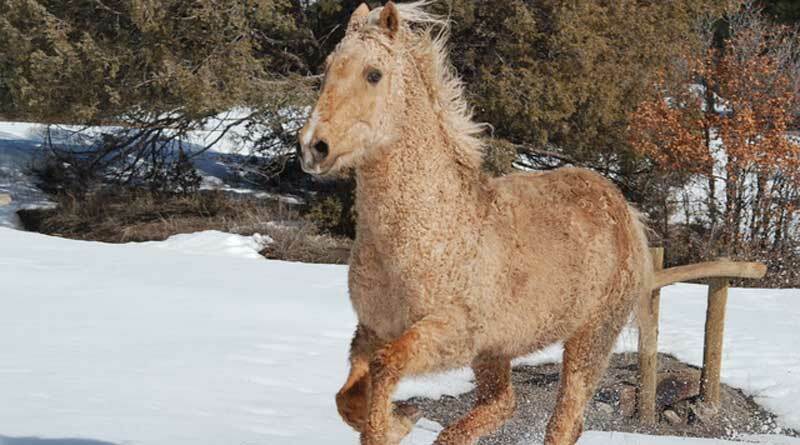 For most of the history of curly coated horses in North America, it was thought there was only one coat mutation that imparted a curly coat to horses. Curly enthusiasts spent many hours speculating about a mythical, “old world” breed that somehow found its way to the North American continent and was the direct ancestor of North American curly horses. We now know that there are many possible mutations that can cause curly coats in horses. The following narrative not only describes a mutation that causes curly coats in a percentage of the curly horse population, but also describes other possible mutations and their effects. One of several gene mutations that are the causative factors in curly coated horses has been isolated by Dr. Schibler and colleagues in France in collaboration with Dr. Gus Cothran at Texas A&M University. A scientific paper was published on November 16,2017 in the journal, Genetics Selection Evolution reporting the results of genetic studies conducted almost four years prior to the date of publication. https://gsejournal.biomedcentral.com/articles The article was titled, A missense Variant in the Coil1A Domain of the Keratin 25 gene is Associated with the Dominant Curly Hair Trait (Crd) in Horse. BFC Spartacular Splashes, owned by Aline & Jeroen Verschuren. The other, unknown, curly hair producing gene mutations were given designations based on founding sires (Curly Jim), founding breeders (Cook), type (Sulphur and Spanish Mustang) or location (Patagonian, Mongolian, or Siberian). Currently, genome sequencing is being conducted by Dr. Cothran and his team at Texas A&M University to isolate other suspected mutations that result in curly coats on horses. This project has been funded by The International Curly Horse Organization on an ongoing basis since 2003. The late Sandy Hendrickson, one of the original founders of the organization, started the project to place the registry on sound scientific principles. Each suspected curly-coat-producing mutation results in horses that have distinctive coat characteristics or phenotypes. In the language of genetics, the different alleles are assigned a short hand description representing the changes in the triplet code for a gene. Each chromosome in the pair is assigned a nucleotide abbreviation based on the type of base which was either the original or the substituted base. Horses carrying two copies of the KRT25 mutation (homozygous) are known to have the tendency to produce sparse mane and tail hair. Although shorter in general, there is individual variation in mane and tail growth, as can be seen from the KRT25 homozygous horses in the pictures below. The mane and tail hair of these horses is curly, but also more subject to summer shedding. These hairs seem to be more easily broken or brittle than normal horse mane and tail hair. Duchess is a domestic curly horse who tested homozygous (AA). SHe is owned by Donna Hedicke. Spartacus is presumed homozygous (AA). He is a domestic founding sire owned by Sandy Hendrickson. Jondra Moonwalk, also AA, is owned by the late Andrea Shcaap. The horse shows a sparse mane and tail. O‘Sparky, owned by Angie Gaines, is a heterozygous (AG) wild-born curly horse from Nevada. Sparlock shows off his summer coat. He is a founding sire of domestic curly horses, who was tested AG by his owner, Donna Hedicke. Blackie, owned by the author, is a heterozygous (AG) wild-born curly horse from Nevada. He is pictured with his winter coat. Blackie in his summer coat. Curly Jim arrived in Mountainview, Missouri, by train in 1956. Curly Jim was bred to many local mares, but the popular gaited line of curly horses came from the breeding of Curly Jim to a non-curly, grade mare known as the “Bradford Mare”. Little information is available about the Bradford Mare. The curly coated foal that was produced from the breeding was a filly named Blaze. Walker’s Prince T was a widely used curly stallion. An intensive scientific investigation is currently underway by Dr. Gus Cothran and his team at Texas A&M University. The study is funded by the International Curly Horse Organization. Its purpose is the isolation of the gene mutation which is responsible for producing curly coats in the descendants of Curly Jim. By studying the pedigrees of Curly Jim horses, some of the phenotypes or coat traits can be deduced for homozygous and heterozygous inheritance, even though the actual gene mutation that produces the curly coats has not yet been isolated. Pictured below is a horse called Kreskin, owned by Jackie Richardson. Kreskin was believed to be homozygous for the Curly Jim mutation. His coat appearance, or phenotype, exhibits the tight body curls characteristic of homozygous horses with Curly Jim ancestry. Kreskin’s mane and tail hair is thick and full which is common in mature Curly Jim mutation horses. This image of Kreskin, and one above, show the show micro body curls on the young stallion, whereas the image below shows him with the full mane and tail of the mature stallion, which is associated with the Curly Jim Mutation. The mature Kreskin with his full mane. Micro curls, or “Brillo Pad” curls are tight, short, and course. They make up the body coat in horses with Curly Jim homozygous inheritance. Horses that are suspected of being heterozygous for the Curly Jim mutation have full manes and tails and body coats that are curly, but not the tight curls found on homozygous horses.  . An example is Sir Patrick, pictured below. Sir Patrick, owned by Jackie Richardson, is pictured above and below in his winter and summer coats. Sir Patrick has a full mane and tail, which is common in Curly Jim mutation heterozygous horses. Shooter, owned by Terry Schmidt, shows the soft, circular curl typical of the winter coat in horses that are heterozygous for the Curly Jim mutation. In Part 2, more types of curly coated horses are presented which do not have the KRT25 mutation. Like the Curly Jim mutation, efforts are under way to discover the genetic mutations that produce these curly coats. Thomas, Shan. Myth and Mystery: The Curly Horse in America, New York: C.S. Fund Inc.: 1989. Scott, DW. Skin of the Neck, Mane, and Tail of the Curly Horse. Equine Vet Educ. 2004; 16:201 -6. Amaral, Anthony. Mustang – Life and Legends of Nevada’s Wild Horse. Univ. of Nevada Press. 1977. Woolley, Dale E. The Dameles and the American Curly Horse. Limited Publication 1993. Sponenberg, DP. Dominant Curly Coat in Horses. Genet Sel Evol. 1990;22:257-60. Bowling, Ann. Horse Genetics. CABI Publishing, 1996. Bailey, E. and Brooks, S. Horse Genetics -2nd Edition. CAB International, 2013. Willett, Edward. Genetics Demystified. McGraw-Hill, 2006. Reveglia, Earlene. Genetic Data Base of the International Curly Horse Organization. ICHO registry site. Curly Traits: including inheritance and curly hair types. and History of the Curly Horse. org. Phipps, Sandy. “Lakeview Curly Missouri Fox Trotters” E- mail correspondence. 2017. Reveglia, Earlene, et.al. History of Curly Jim Line. ICHO, investigation: yrs. 2000 – 2005. Zierler, Karen. The North American Curly Horse – Buffalo Pony to Modern Working Horse. 2015. Laughlin, Mike. Great Basin Curly Horse Buckaroos: The Dameles. Cowboy Showcase. 2004. Pierce, Benjamin. Genetics: A Conceptual Approach, 5th Macmillan Pub., 2013.